In Argentina, “buena onda” can be used to describe someone cool, express good vibes, or refer to when things go smoothly. Buena Onda, a new pop-up at Old Town Goleta’s Goodland Kitchen & Market, embodies this Argentine expression with a menu of South American specialties. Each dish is executed with a mix of old-world authenticity and regional flavor. Tomás Baistrocchi and Matias Requena, the two Argentines behind Buena Onda, can be found slinging empanadas at the Goodland every Thursday, Friday, and Saturday night. On Fridays and Saturdays, the menu also features a rotating selection of South American dishes, such as Peruvian ceviche, a type of shredded corn tamale called humita en chala, fresh seasonal salads, arepas, and more. Empanadas are the house specialty, according to Baistrocchi, who has 10 years’ experience working in fine dining, including a recent stint at Santa Barbara’s El Encanto. While this experience is definitely different from his previous work, Baistrocchi said it is extremely satisfying to be cooking his own food for what he describes as “his people.” They serve five varieties of empanadas that represent a range of regional styles from across Argentina. Baistrocchi and Requena are both committed to quality and strive to use the best regional ingredients as often as possible, sourcing from the Santa Barbara Farmers Market as well as Kanaloa Seafood. Requena’s mom, dad, and sister pitch in, too, serving dinners and manning the cash register, adding to the warmhearted feeling of conviviality that permeates the food and atmosphere. Business is picking up at a steady pace, said Baistrocchi and Requena, who sell about 1,400 empanadas every weekend. 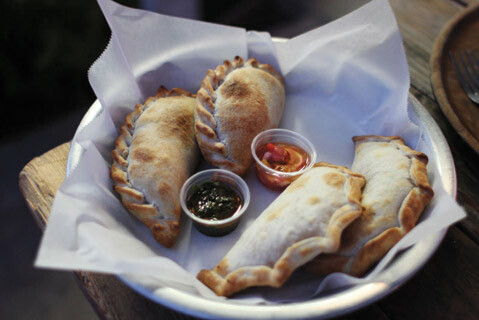 Buena Onda pops up at the Goodland Kitchen (231 S. Magnolia Ave., Goleta;  845-4300) Thursdays to Saturdays, 5:30-9 p.m., with empanadas often served until midnight.